All the while, I cooked but just didn't write about it. We may have eaten soup, fish tacos, and homemade pizza week after week for a while, but these are tasty, brainless, and easy. Luckily, we're past that. Fast forward to my favorite time of the year, autumn, that officially started yesterday. Fall passed by in a blink of an eye last year, and I'm committed to fully enjoying every day of the season. This includes changing our menus and the foods we eat. 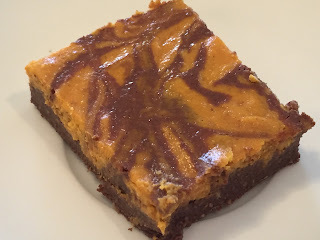 Since everyone and everything is pumpkin crazy, I made these decently, rich, fudgey pumpkin brownies to jump start the season. The ingredient list is surprisingly easy on the waistline - gluten free too, no wheat - but the taste is rich and slightly spicy. Welcome back to blogging! Big changes in your life. I dunno about having to change out of yoga pants, though to do work. ;-) Hope the travel is fun. These brownies definitely look like fun! Thanks.